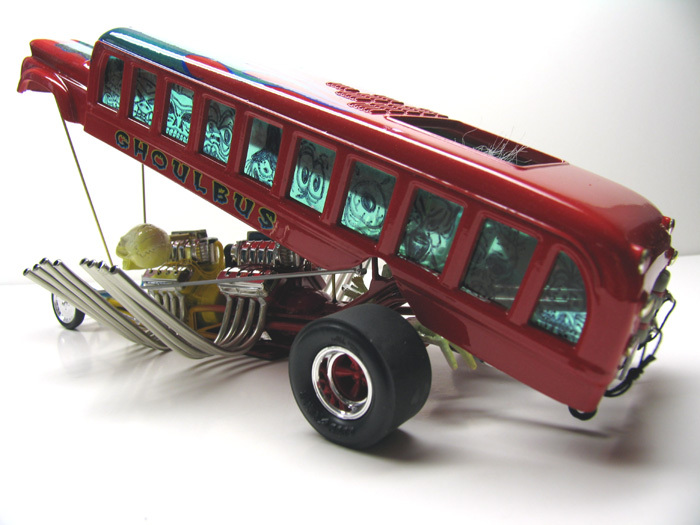 S’Cool Bus body was sectioned from the bottom approx ½”. Stinger dragster chassis and rear axles were lengthened and reinforced with brass tubing and rod, front axle moved back. Body hinges and support were fabricated from the same. 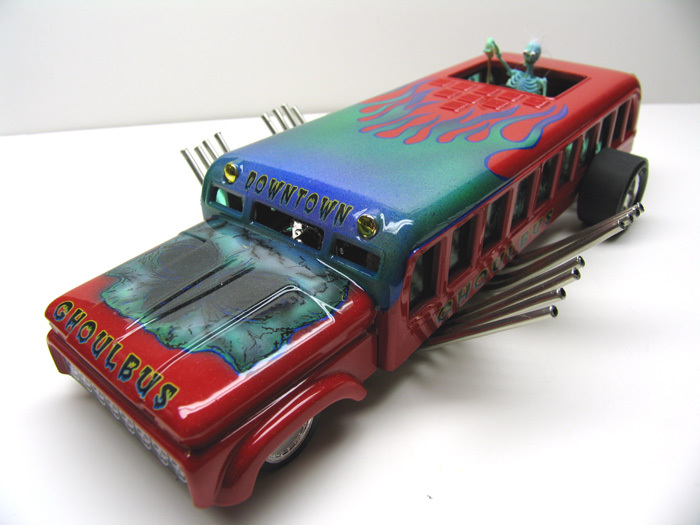 The fuel tank is milled aluminum, water tank is bisected S’Cool bus tank mounted on its side. 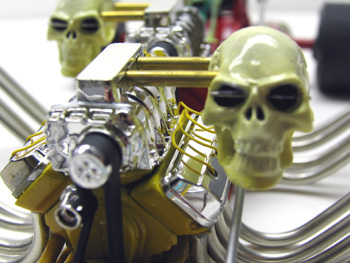 Motors from S’Cool bus fitted with milled aluminum magnetos and plug lines. Blower intakes filled and foiled, drilled for side-draft mounted skull intakes, which are fitted with photoetched butterflys mounted on stainless straight pins. Headers are hand made from silver solder, drilled out and then clear coated. The dash is inverted Stinger fitted with photo reduced guages with metal trim rings and epoxy faces. The photoetched steering wheel is flame-cut, and has a metal ring. Dash supports, shifter, and steering rods fabricated from brass and aluminum tubing. 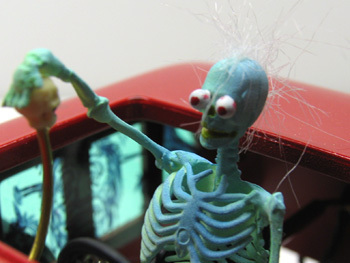 The skeletal driver is from the Lil’ Coffin, and has been repositioned, fit with pinhead eyeballs and hair. Rims and front tires are from the Stinger, rear slicks are vintage MPC. 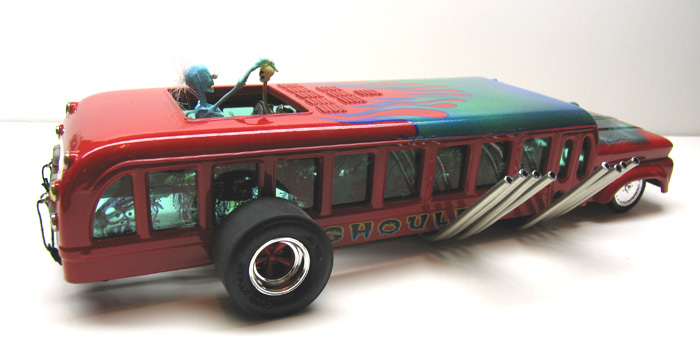 Modified S’Cool Bus wheelie bars are held in place with Aurora zombie hands. The entire build was airbrushed with Createx AutoAir water-based paint, then clear-coated with House of Kolors Kosmic Klear with super rainbow micro flake. 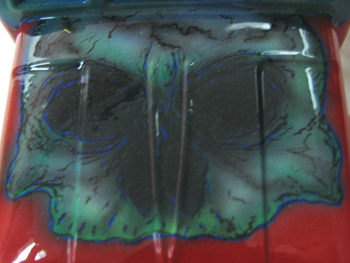 The skull graphics and flames were airbrushed over handmade friskets , and later hand outlined with a 000 pinstripe quill. Decals were custom made by Dan Warford from Slippery Arts. The windows were made from clear mylar, then details drawn in with a fine point Sharpee pen, then airbrushed with “The Detailer” window tint. 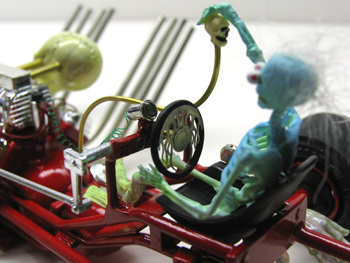 The seat and skull shift knob are cast resin. Chute lines are made from heavy sewing thread that has been braided. Numerous small modifications were required to the body and chassis to make them fit properly.